With Pangu out for iOS 8/8.1 and Cydia getting an update soon, it’s time we did a tutorial on how to jailbreak your iOS device running iOS 8 and above. 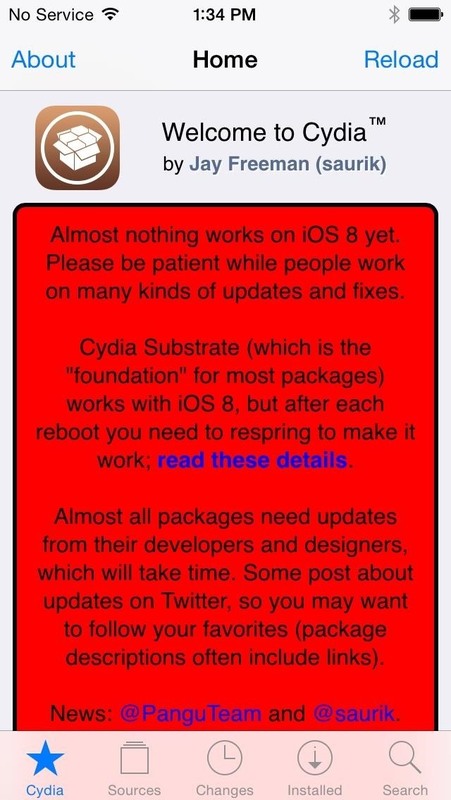 In addition to jailbreaking, we will also be telling you how to install Cydia on your device. Before starting, you should back up all the data and apps on your device completely to avoid any data loss in case things go wrong. So let’s start. After you’re done backing your device up, you should also disable ‘Find my iPhone’ and lock screen on your device as well. Also make sure that you’re running iTunes 12.0.1 or higher on a WINDOWS PC, since Pangu for iOS 8 and above for Mac isn’t available right now. 1) Download And Run Pangu 8 v1.1.0 For Windows. To start the process, head over here and download Pangu 8 v1.1.0 for Windows. After you’re done downloading the file, open the file directory and right click to run the application in administrator mode. After the program is up and running, connect your iPhone, iPad or iPod to the PC. 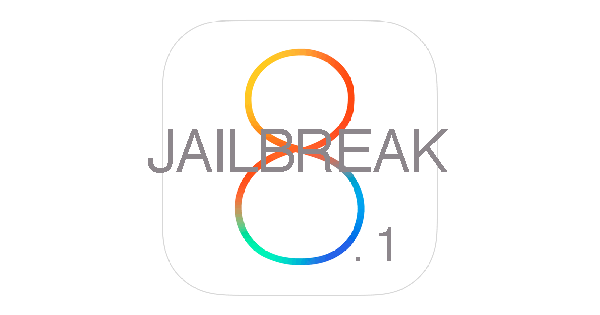 2) Fire Up Pangu And Jailbreak Your Device. After you’ve run Pangu as administrator and connected your device, the user interface for Pangu will open up. Don’t worry, you don’t need to decipher all the Chinese language written here. All you need to do is Uncheck the only checkbox option on the interface and click on the blue rectangle in the center at the bottom. (Keep in mind the screenshots represent the older Pangu version. Since Pangu is now in English, the process is fairly straightforward) Also, you’ll see that there’s no checkbox in v 1.1.0. Just click on the start jailbreak button after connecting your device. This will start the jailbreaking process for your iOS device. To continue from here, head over to your device, which should reboot a couple of times during the process. After its done rebooting, you’ll need to repeat the same steps on your device. After your device turns on, locate the Pangu app on the screen to verify completion of the jailbreaking process. After you’re done jailbreaking your device, the next step is to install Cydia or you won’t be able to fully take advantage of the functionality that comes with it. Keep in mind that while jailbreaking iOS 8 and above can only be done through Windows currently, installing Cydia can be done either through Mac or through Windows. 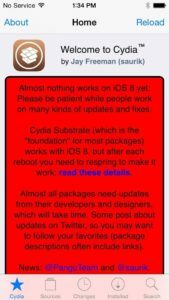 1) Download The Relevant Cydia Files For Installation. In order to install Cydia on your device, first you will need to download three files. They have been listed below in order. WinSCP (Windows) or Cyberduck (Mac). 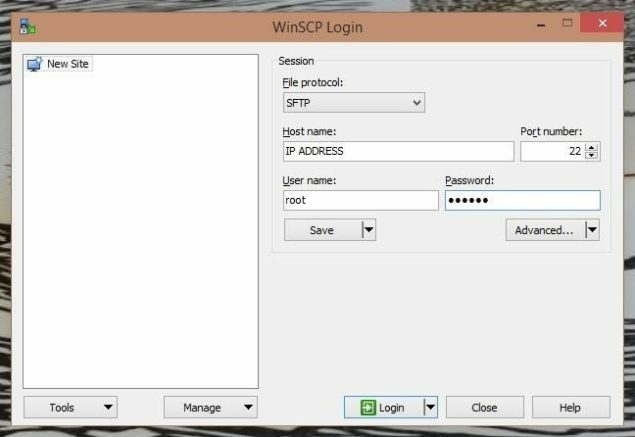 These are SFTP client files which you have to install on your computer once they have been downloaded. After you’ve installed the client and downloaded the relevant Cydia files, connect your computer and iOS device to the same network and then proceed to write down the ip address shown in your gadget. 2) Open The Pangu App And Install OpenSSH. The next step on the process is to open the Pangu app on your iOS device, select OpenSSH and hit install. No further user steps are required beyond this point except for hitting okay once you see that the process has been confirmed. After you’ve installed OpedSSH, open the SFTP app that you downloaded in the first step on your PC. Make the following entries into the corresponding sections shown in the image below. 4) Enter SSH Commands Into SFTP App. Next step is to enter two commands into the SFTP App that you’ve installed earlier. In WinSCP, go to commands, click on open and click Ok on the pop up that opens up. This will open a console terminal, in which you’re going to enter the following two commands one after the other. Make sure to let the first command run completely before you proceed to enter the next one. After you have entered the commands, disconnect and reboot your device. 5) Open Cydia After You Have Rebooted Your iOS Device. 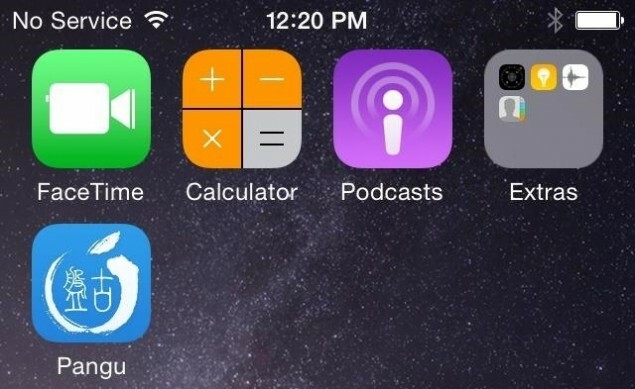 If you have followed the steps above correctly, the Cydia app should now appear on the home screen of your device. Tap on it to open it up. 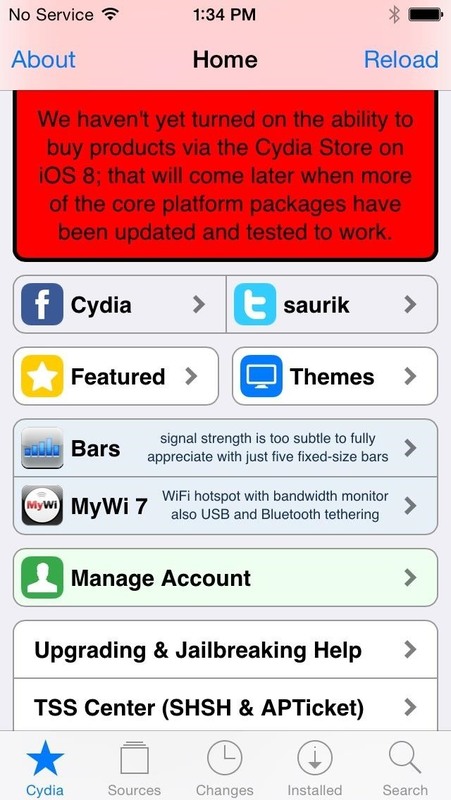 Running for the first time, Cydia should look like this. After Cydia has prepared your files system, it will exit and you will have to launch the app again. Open it up to see some bad news from the app’s creator. So that’s it folks. You have now successfully jailbroken your device and installed Cydia on it. Now all we have to do is wait for apps to be updated for iOS 8/8.1 and we’ll be all set to go.